all in the most beautiful river valley in Australia's South West region? Then look no further! 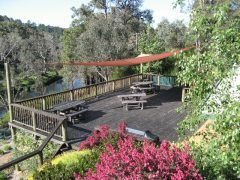 Tweed Valley Lodge is a 4 star adult retreat with a touch of paradise, promising you a memorable stay in the best accommodation of its type in the Blackwood River Valley region. All suites are spacious, beautifully appointed and self-contained with private facilities. Each suite has magnificent riverside views from inside the room as well as from your own verandah, where you can enjoy the birds, the peace and tranquility of this riverside paradise. View Tweed Valley Lodge's luxurious suites. Magnificent old Marri trees line the riverbanks, providing a stunning backdrop to the beautiful parkland garden setting. Here you will succumb to pure, unsullied tranquillity you probably thought no longer existed in accommodation so close to a town centre - yes we are just 2 km from downtown Bridgetown and only minutes from a variety of local attractions, galleries and wineries. 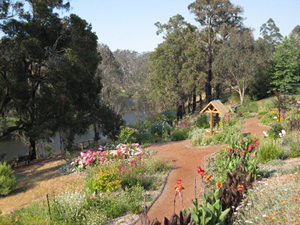 Every guest is awed by the surrounds of Tweed Valley Lodge. The views from your verandah and throughout the property are simply breathtaking. 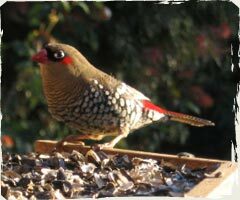 The only early morning wake-up call you will hear is the natural kind, unselfishly offered by an amazing variety of Aussie bush birds that call the Blackwood River Valley home. Then you awake peering through nature's window - stunning river views and country garden aromas. Daily bird feeding and bathing is a highlight with a multitude of parrots and other bird species providing a continuous flow of traffic along a natural corridor right on your doorstep. 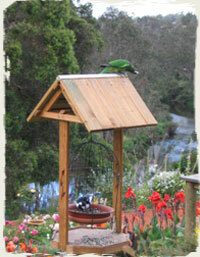 View some of our feathered friends. An expansive sail-covered decking / BBQ area, attached to all suites via the boardwalk, provides a magnificent panoramic view of this riverside property. 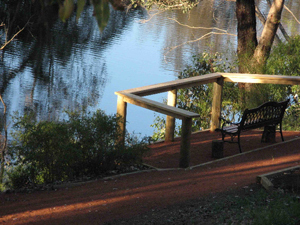 The boardwalk leads you to soft, flowing pathways through the riverside garden where you can sit and take in the beauty and serenity of this piece of paradise. One-night bookings are acceptable except during long weekends and special event periods. Get current availability, obtain a quote and/or make a booking. The Lodge is ideal for adults seeking a quiet, peaceful and relaxing sanctuary in a spacious suite where you can savour the peace and harmony Mother Nature has to offer. Hosts Julian and Jenny have created the home away from home you will want to visit again and again, confirmed by testimonials from our happy clientele.